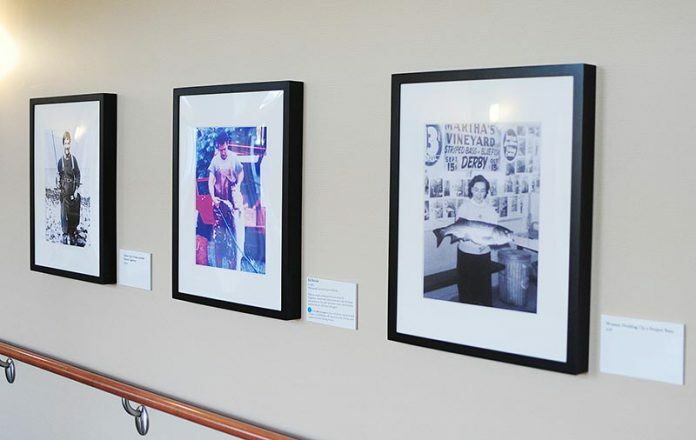 Photographs documenting almost seven decades of the Martha’s Vineyard Striped Bass and Bluefish Derby are now displayed on the walls of the long first floor hall of the new Martha’s Vineyard Hospital. It is one in a series of displays that make up the hospital’s eclectic collection of art. The photos include weigh-in scenes from the 1950s, portraits of well known Island fishermen, anglers in action, and classic shots of large fish. In all, it’s a fun peek at the annual community tradition and adds a unmistakably Island feel to the new hospital’s interior, high ceilinged and architecturally distinguished, but not homelike. The exhibit was assembled from a show that ran roughly parallel to the 2013 Derby at the Martha’s Vineyard Museum in Edgartown. Museum curators Anna Carringer and Lindsey Lee selected the photographs from an archive of more than 1,000 images the Derby committee donated to the museum in 2001. 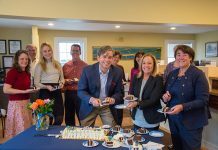 While the new hospital has boasted a museum-like collection of works from Island artists, including a growing permanent collection of Island themed art donated by the artists and by private collectors, hospital board vice chairman Edward Miller, who is also chairman of the art committee, said it is a hospital first and not a museum. He said that hospital directors have reserved the long windowed hall for temporary, rotating exhibits. He said he expects the Derby show to stay up for about a year, depending on the community’s response.